A group of South African soldiers are sent out into the bush to find and destroy a rebel group that killed an earlier patrol. When they find a small village with all the men gone, the soldiers panic and slaughter the remaining villagers, including an old witch doctor. As the group tries to make their way back to camp, strange things begin happening to them. Are the enemy soldiers normal humans, or have they been cursed by the old shaman? "The Stick Reviews” http://www.imdb.com/title/tt0094038/reviews Web. 17 Apr. 2014. Berdinski, Thomas. 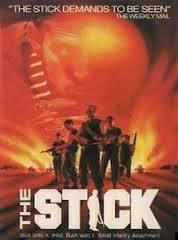 "The Stick (1987) Movie Review by Thomas Berdinski Director of The Italian Zombie Movie 1 & 2." Horrorphilia (online blog).